Two new businesses have found their homes in the Village of Lewisburg. 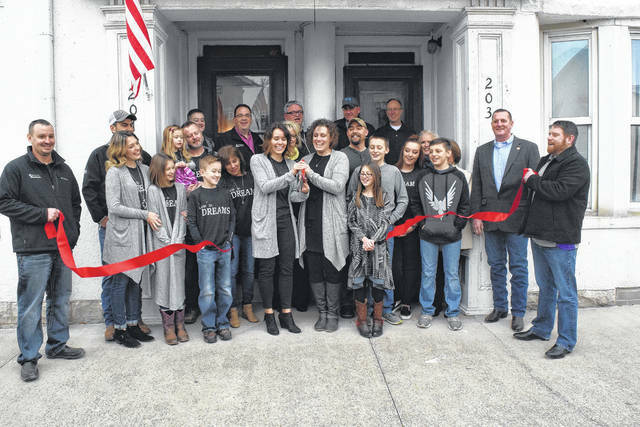 Located in a beautifully restored duplex, Livin’ on Dreams Boutique and Paisley Perfect Photography by Mandy Studio held their ribbon cutting ceremony and open house on Saturday, Feb. 17. The two owners were joined by their families, support systems, and village representatives for the ribbon cutting ceremony. Pictured above is Jessie McPeck (left), owner of Livin’ on Dreams, and Mandy Pahl (right), owner of Paisley Perfect Photography. LEWISBURG — Two new businesses have found their homes in the Village of Lewisburg. 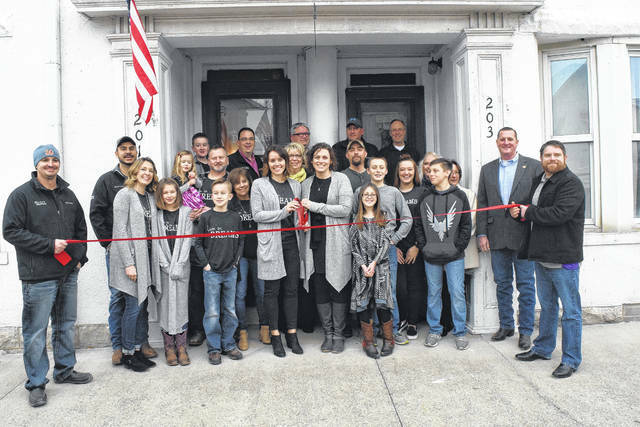 Located in a beautifully restored duplex, Livin’ on Dreams Boutique and Paisley Perfect Photography by Mandy Studio held its ribbon cutting ceremony and open house on Saturday, Feb. 17. The businesses are owned by Jessie McPeck and Mandy Pahl. McPeck owns Livin’ on Dreams, which she says is inspired by her father, while Pahl owns Paisley Perfect Photography, which is the culmination of her lifelong love of photography. McPeck explained, “I left teaching and this just kind of evolved. Livin’ on Dreams is a name I am borrowing from my dad, who we lost to cancer two years ago. A portion of any t-shirt sold with his name on it goes to the American Cancer Society. This just evolved from that. In the boutique there is women’s and children’s clothing sizes 2T-3X. Pahl also took her business name from her family. Paisley Perfect Photography is actually named after her daughter and born years ago out of a natural love for photography. “I have been doing photography for 15 years and I just enjoy capturing memories for everyone. I do families, weddings, babies, children, and almost everything. It is nice to have an indoor spot for when it’s cold outside,” she said. She will be available for both indoor and outdoor sessions of all types. She has a dedicated spot for newborn sessions, but also a spot large enough for family sessions. She also has an office for consultations. The women decided to open their businesses in Lewisburg, McPeck explained, because the village is her hometown and she wanted to contribute to the downtown economy. https://www.registerherald.com/wp-content/uploads/sites/41/2018/02/web1_Ribbon1.jpgTwo new businesses have found their homes in the Village of Lewisburg. 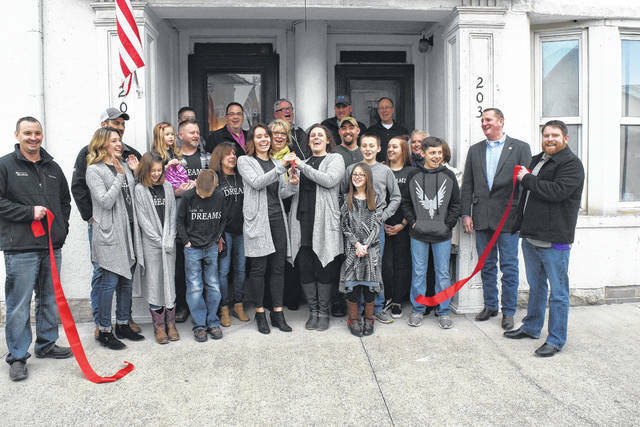 Located in a beautifully restored duplex, Livin’ on Dreams Boutique and Paisley Perfect Photography by Mandy Studio held their ribbon cutting ceremony and open house on Saturday, Feb. 17.
https://www.registerherald.com/wp-content/uploads/sites/41/2018/02/web1_Ribbon3.jpgThe two owners were joined by their families, support systems, and village representatives for the ribbon cutting ceremony. Pictured above is Jessie McPeck (left), owner of Livin’ on Dreams, and Mandy Pahl (right), owner of Paisley Perfect Photography.